When I visited Hoover Dam in Nevada it was a late afternoon in November. Although the sun was still out things were becoming shadowy, which added to the drama of the scenery. I had the opportunity to stand on an observation deck with an unobstructed view of the dam. It was so massive that I just stood and stared at it for a long time. This picture shows the shadow of the bypass bridge against the dam. After that I walked on the sidewalk toward Lake Mead and I could see shadows forming there too. Here is some of what I saw. More shadows can be found here. This entry was posted in Travel, USA and tagged Hoover Dam, Nevada, postaday. Bookmark the permalink. Thank you Naomi – it was quite a view! Love them all, but especially the first one. Really interesting shape movement through shadowing. wonderful place and wonderful shot!! Thanks Bea – it really is an interesting place! It’s not easy to take photos there. These are fantastic shots, Meg! Thanks Ruth – I thought that the shadows made it so interesting! I especially like your first shot, Meg. That particular capture really captures the topic at hand. Thank you – I was impressed with the details of the shadow too! Hoover Dam is really amazing when one considers the time it was built and what a grand construction it is and it is still standing! The area around Lake Mead is beautiful and rather ghostly at dawn or dusk. Great photos. Happy travels in 2015. Thanks Teresa! The history of the dam is really interesting and it was a great visit. Happy New Year! 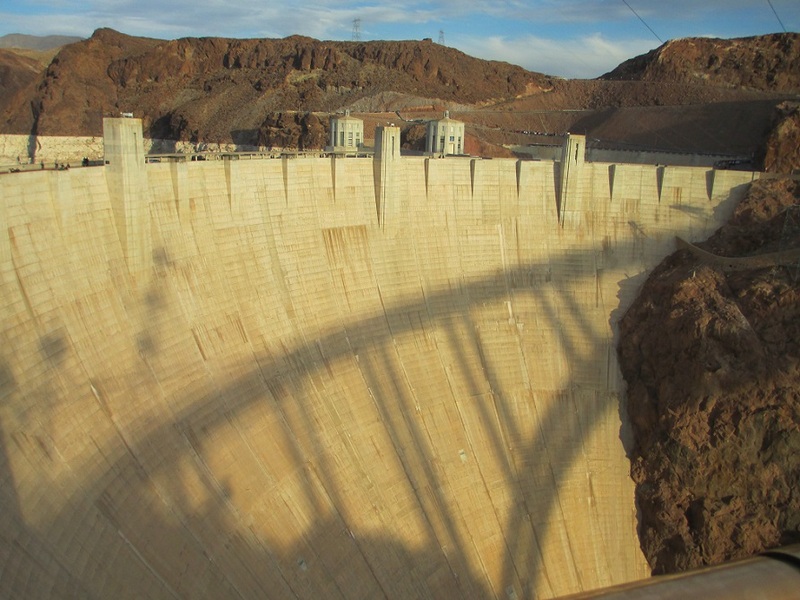 What beautiful shots of Hoover Dam! I would love to visit this amazing structure some day. Great shadows! Thank you Elisa – I thought that it was a fantastic place to see and the shadows made it even more fascinating! It was so impressive and I’m really happy that I got to see it! Thanks Jo – the sun and shadows made the scene so dramatic! I love the effect of shadows and light against structures. Nice. I love these dramatic shadows, Meg. Dams are always very grandiose, imposing places. Your shadows give them an added sense of the mysterious. Thanks Tish – I’m so happy that I was there late in the day to see the added drama of the shadows!